I’d love to hear how other people keep up with long-term works in progress. 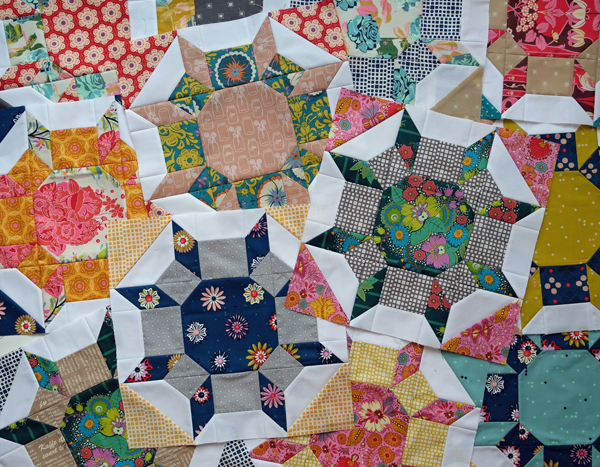 These are my 12 Shimmer quilt blocks from Cluck Cluck Sew's pattern. I like to take my time piecing these to make the corners and points sharp. I could stop at 12 blocks and make a small quilt, but I’d rather keep going, even if it takes me all year. This is the sort of WIP that doesn’t bother me at all. I keep the stack in a place that I can see often, which makes me want to add to it every few weeks. The pile keeps growing. Eventually I’ll have a quilt. Jazz hands. The projects where the momentum gets interrupted for whatever reason — busy life, need to finish something else, took a wrong turn and need to rip some seams. Whenever I remember these neglected projects, it bothers me that I let them languish for so long. I have at least two quilts like this that I’d love to finish. How do you think about your longer-term WIPs, and how do you turn them into finishes after they’ve stalled? I've got a few long term WIPS, one I've totally lost interest in and two others that just need a bit more done to them. Not sure what to do to finish them, but I really want them done! One is in a place that I can see it every day ~ a EPP of a LaMoyne Star. It really is pretty wonderful and would be lovely to have it done. Good luck! I agree that keeping the project in view helps a lot. My two stalled WIPs that I'd really like to finish are tucked away and forgotten. I need to pull them out and restart the momentum. I tend to be a one-project-at-a-time person, so I don't have on-going, long-term WIPs. The WIPs that I do have are usually ones that got stalled because I couldn't find the right fabric or just lost inspiration somehow. Those can sit for a long time! I hide them away in a box and hope that when I next look at them, I will once again be inspired. So far it is working..though some had to sit for years and changed direction once I got back to them. I can relate to that. Once I get some extended sewing time, I want to pull out my two forgotten WIPs and finish them. That will feel so good! The WIPs in category 1 have ended up quite often with our church quilting group. They finished them, and they are then donated for a charity auction held every April. I struggle most with Category 2 as I start projects with so much enthusiasm, and then get distracted by something else. In the last two years, I have worked very hard at finishing some of these. And I'm actually making some progress! !